Sure, there are resources online that give tons of tricks and tips for maintaining your toilets and dealing with clogs. Most seem to involve a plunger at some point or another, which is fine. As a Seattle area plumber, I can tell you that it doesn’t always feel necessary for me to show up just to plunge away a toilet clog, but I’m happy to do it if that’s what a customer wants or needs. This blog post isn’t an opportunity for me to rant and tell you that you need to plunge your own toilet. Quite the opposite, in fact. Because as it happens, I’ve seen plumbing and sewer maintenance costs skyrocket when customers get over confident and perform hackneyed DIY plumbing jobs. Sure, knowing how to unclog your own toilet is great, but attempting DIY plumbing and maintenance when you’re out of your depth and have little experience is a surefire way to cost yourself more money in the long run. Simply put, when it comes to your toilet and its maintenance, you’ve got to know when to put down the plunger and call a professional. Here’s one that, as a Seattle Plumber, I’ve been contending with most recently. With the temperatures dropping in the Emerald City pipes are freezing up left and right! This is a problem that has tons of DIY tips listed for it online, but be careful; messing with frozen pipes on your own can be risky. Remember when a pipe freezes, the frozen water creates an airtight seal through which water cannot pass. If this is happening with your toilet’s supply line, your toilet won’t fill or flush until you thaw the pipe, which can quickly cause problems. Plus, if improperly handled, a frozen pipe can burst, causing a multitude of other issues. It’s best to hire an experienced professional with a thawing machine to take care of this for you. You’ll have the confidence knowing it’ll be done correctly, and if any other issues do arise you have a professional on hand. If your toilet, something upon which your household certainly relies on, freezes it’s always best to avoid dealing with it on your own. This one is rather obvious, isn’t it? Sometimes you have a clog that, no matter what you do, just won’t come dislodged . After they’ve exhausted the plunger, the chemical de-clogger (which you should always avoid), and the baking soda & vinegar trick, many stubborn at-home DIY-ers start thinking of ways they can take the toilet apart, how they can create a makeshift snake, or other little tricks they think will save them money. If you’ve been plunging and you’ve also tried a store-bought de-clogger, then it’s time to call a plumber. No amount of research is going to make you as qualified as a pro who’s seen countless variations of clogs over the years. A running toilet is not only annoying, it’s costly and, at times, difficult to diagnose. 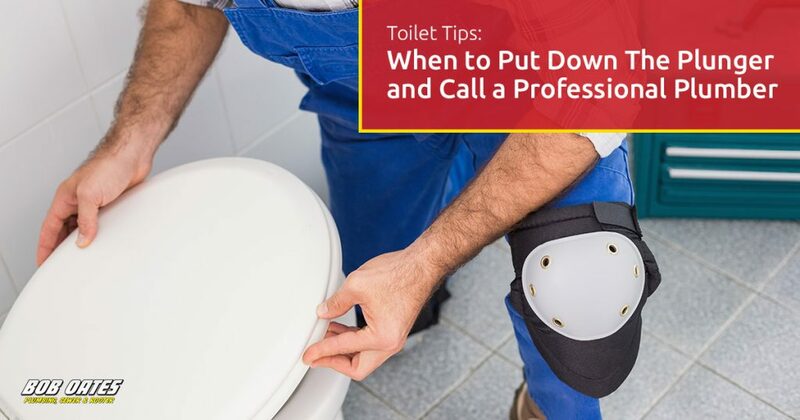 If you’re finding yourself messing with the toilet each time you use it just to get it to shut up, it’s likely time to replace the inner components. Anytime your plumbing equipment – be it a toilet, a drain, a water heater, or anything else – needs to be worked on, you’ve officially exited DIY plumbing territory. Toilets often run continuously when the flap that lets water flow from the tank to the bowl through a valve no longer fits as it should. Sometimes, the float isn’t balanced or the fill tube gets loosened. There are times, however, when toilets run for a more complicated reason. Whatever the cause, unless you really know what you’re doing (i.e. you’re a pro yourself) it’s always best to call a professional to diagnose and treat a continuously running toilet. Those of us with kids know this issue far too well. Sometimes an action figure or a doll meet an untimely demise in your toilet bowl, which is never good for either your home’s plumbing or that poor toy. Sometimes it’s something else, but whatever the item may be, foreign objects are often the culprits of toilet clogs that you can’t diagnose and that you can’t plunge away. On top of that, foreign objects can also cause damage to your sewer septic lines, provided they pass beyond the toilet. In any case, if you suspect or you know that a foreign object like a toy, or another unflushable item, has made it’s way into your toilet, it’s best to put down the plunger and call a professional. A hidden leak is exactly what it sounds like: A leak that you can’t see. Hidden leaks often occur behind a wall, or beneath the floor, which is where they can cause the most damage. Additionally, hidden leaks, often a result of overly strained or clogged toilets, can cause unpleasant odors to waft throughout your home. Sometimes, this is how you’re able to first detect a hidden leak, which is unfortunate, because if you can smell it, but you can’t see it, some serious damage may already be done. In this case, mold may have formed, which smells terrible and can cause respiratory issues. Higher water bills might also be an indication of a silent leak. If you suspect a silent leak, you’re better off consulting a professional. There’s little that you can do on your own and you certainly don’t want to go and cause further damage. If you’ve been contending with any of the above issues, or you’ve got another plumbing issue that likely needs a professional, don’t hesitate to get in touch. As a Seattle area plumber with more than 30 years of experience, I’ve seen my fair share of toilet clogs and issues, I’ve also seen the various ways that stubborn do-it-yourselfers have shot themselves in the foot by thinking they have a handle on plumbing and sewer maintenance when they don’t. Do yourself a favor, if you think you may need a professional plumber, just give them a call…you won’t regret it.